Those Blue Shoes is available from the author, leave a comment. 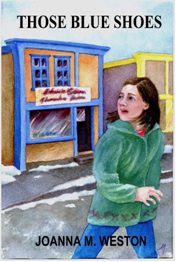 When Meg tries on a pair of blue shoes in Edward Swann’s shoe store, she is whirled into another life and another time. She meets Hannah who demands Meg’s blue shoes because, she says, they are hers. Meg faces danger from Hannah, fear, and difficulties at home, because she wants to rescue Laura and Derry who are trapped in Hannah’s world. She must hang onto the blue shoes in order to get home again.